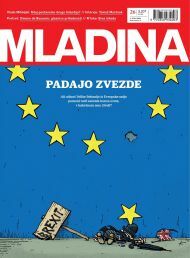 I translated an article in Slovene about Brexit from a popular Slovene Magazine Mladina. To be clear, the following text is not mine, it was written by Grega Repovž and the original can be found here: http://mladina.si/175145/cas-za-delavsko-internacionalo/ All the rights are retained by the original author. I only translated it after the article became freely available online (as is the case with all Mladina articles a week after they appear in press). Time for The Workers International! The British did not vote against the European Union, but against the free movement of labour. And they are right: the European labour market benefits the rich and the Capital storming Europe weakens and destroys it. Of course you can point the finger, join in, and be appalled at the Brits. Look at them, they really are racist, you’ll be saying, that is what this was all about. They do not like the Poles, they do not like the Slovenes, and they do not like the Pakistanis … But the truth was actually clearly indicated by those Brits who have voted to exit the European Union: The free movement of labour along with the free movement of capital and services, that is presently the foundation of the EU, to them signifies an unfair competition among employees, reduces labour and social rights of the population, and leads all those UK residents who can only offer their labour, into an ever growing spiral of increasing hardship. And the immigrants are victimised in exactly the same way. Of course, the Brits, who have voted to leave the European Union, do not say that they are bothered about the free movement of labour. Most of them are less politically savvy voters. They believe the immigrants stand at the heart of the problem. But if each of us makes a list of friends and acquaintances, who from 2004 to today went to Germany, Great Britain, the Netherlands, France, etc., found a job, and created a new life, a pattern will emerge. If we exclude those in highly skilled positions, whose pay is tied to their specific knowledge, we’ll find that in most other cases these workers’ salaries are lower than average in that country (for that position). In addition, most of these individuals do not hold open-ended appointments and their job security is generally poor. Out of of my acquaintances, in all but two cases (one working at a University, another in a hospital), no one is paid equal wage compared to their British co-workers. Even my two acquaintances are not quite convinced that their status is really the same, although they are reluctant to talk about it at work. Almost everyone who is not extraordinary in some way, works more than allowed to by law, has a lower standard of living and is paid less than their British, German, or Dutch colleagues. The vast majority of those who perform less demanding jobs, does not hold a long-term or open-ended contract, and their workdays are longer than it’s legal. They work Saturdays and Sundays, and their pension plans are minimal or non-existent. Many of these people have been interviewed in various Slovenian newspapers, or on the national television. Their life stories were presented as an umitigated success in Slovenia. While in fact these individuals do not live so well. Most Slovenians who work abroad, did not get their jobs because they were above average, but because they are simply willing to work more for less pay compared to Britons. In most cases they receive no workers benefits or allowances which are common for Brits and indeed for those Slovenes who remained in Slovenia. Starting with the the paid leave, which for many is significantly lower or non-existent. But these are only the most visible cases. The easier the job, the less likely is it for employers to observe the EU (or British) standards of employment and the more likely that the job will be held by an immigrant. The harshest cases can be found among those who work through the various employment agencies. They do not appear on the labour market as employees, but simply as a service that is, for example, offered to a German or a British company by a Slovenian agency. We are very familiar with these cases in Slovenia: TV Slovenia journalist Jelena Aščić monthly discloses the horror stories about abuses that happen through these agencies. Although the spin is usually that this is a shady business practice that only happens to Slovenes, perpetrated by Slovenian companies. In fact this is now a normal standard in the European labour market. European companies everywhere use this cheap labour from Countries that have a lower standard. Slovenian companies do the same thing by, for example, “importing” cheap workers from Croatia. In Germany, several million individuals live and work this way. Of course, Slovenia is not at all different: Slovenian construction sites are full of employees from former Yugoslavia, as well as from Romania, Bulgaria and other Countries. They are working for substantially lower salaries than their Slovene counterparts, labouring for 14 hours a day and living in (for us) impossible conditions. They receive their money directly through 3rd World shell companies, and this is all tolerated for the sake of increased productivity. The Capital, the higher classes and partly the middle class, reap the only benefits from the free movement of labour. Everybody else suffers from it. Let’s look at the issue from the other perspective – from the viewpoint of the resident workers. Social classes hold differing opinions on the precariat. Higher and middle classes across Europe reap benefits from this cheap labour – their lives are more comfortable and affordable. If the shops, cafeterias and other companies that are part of the service industry employ cheap labour, they can lower their prices and thus their customers can benefit. If a local plumber from Manchester gets away by hiring Polish workers, who are paid less (and outside the established Union rules), they can therefore have lower prices and their customers benefit. The richer the individual, the more they stand to gain from the influx of cheap labour. Benefits span various governmental systems too – for example, the health services across Europe are increasingly hiring nurses and servers educated in poorer Countries, because they are cheaper. These immigrants usually come from poor living conditions and are willing to work longer hours for less money, they live in poorer and smaller flats, and are ready to give up many things, which are otherwise completely run-of-the-mill in a Country where they live now. Often these individuals are employed through the “inventive contracts” that allow for lower standards. Today most of the EU economy is based on this abuse of labour – Slovenes might be used to this kind of movement of labour as it used to be governed by international treaties (for example, between Yugoslavia and Germany in the seventies). Nowadays all of this is covered by the fundamental documents of the European Union. Moreover, that is the essence of the European Union: the free movement of capital, services and labour. However, everything is part of the globalisation process, still one of the inviolable postulates on which the world is founded. This of course benefits the Capital first. It can not be denied, however, that the most underdeveloped countries and their citizens also reap the benefits. But on the other hand we get a shaken proletariat in the Western world. Great Britain is not a typical European Country, for its standards were the first to decline. In fact, they were the first in Europe to introduce the most ruthless neo-liberal doctrine (under the auspices of the then Prime Minister Margaret Thatcher). And even after the austerity crisis, Britain has remained committed to the European austerity strategies. All the proposed cuts have been enacted by the British government itself. This coincided with the opening of the labour market, though. Great Britain is one of the end links of the worker migration chain. I am saying this as young people from Germany, Sweden, or the UK, except for the highly specialised ones, do not leave for greener pastures around the world, as a rule. There is no need for that. This puts them in a stark contrast to young Slovenians who move to the UK in order to improve their lives. The Brits mostly relocate to Slovenia after they retire (especially if they are working or lower middle class), because the cost of living is so much lower here that their pensions afford them a better quality of life. The European open labour market poses a large existential problem for less educated Brits across all of Europe. Their main difficulties are now largely linked to the open labour market. How, for example, can they compete with a young Slovenian girl who is prepared to share an apartment with four other seasonal workers; who is ready to forget about having a pension scheme, and the usual number of days of leave? How can they compete with a Croatian tire technician whose monthly salary at home was 340EUR and plans to earn some money and return home to Osijek in five years? Let’s make another step towards the understanding of the emerging unease: How is a normally-situated Brit to compete with a Syrian refugee who has lost everything and is completely destitute? Someone who does not care about a pension plan, and is prepared to work seven fourteen hour days per week, without ever going on a leave? How can a young Hamburg architect compete with a young college graduate from Slovakia, who is perfectly willing to live in substandard conditions, only to gain hands-on experience? In addition, his apprenticeship wages will be only half of the German’s apprenticeship wages, but at the same time they will amount to six times the average wage in Slovakia. Is it really so abhorrent to oppose this state of play on the European markets? The British, who are today protesting against the European labour market, are not asking for anything extraordinary: they only want to stop the erosion of their social, labour, and general rights that is carried out in the name of allegedly higher goals (which are in fact, just a push for higher corporate profits in disguise). UK politicians are constantly pointing to the European Union as the culprit in this, although the truth is the reverse: the neoliberal social order in Europe is emerging from Great Britain, and not vice versa. The working class’ frustration is much greater because Great Britain is evidently not a Country in crisis, with its GDP constantly on the rise and with ever increasing corporate profits. At the same time, in the entire post-crisis period (which coincides with the freeing of the labour market), the wages in the UK when pitted against inflation, are declining, social rights are constantly being reduced, and jobs are getting less and less secure. Things are similar in Germany, even though this a Country rising quickly in the economic sense. Obviously the emerging inequality is not felt by the higher and middle classes, together with employees in the public and state administration. However, all the manual workers and those working in less demanding jobs experience it daily. Their standard of living is falling, despite the good macroeconomic results. They are the ones who suffer the consequences of a single labour market, they are facing cheaper workers from poorer European countries, and from Syria, Turkey, and Iran. In this market there are no longer any rules, and that effectively allows for the justification of any current neo-liberal economics. Are the Brits not in the right to oppose these inhuman conditions? Why should they support something that increases inequality, as it forces them out of the labour market, a system that makes them uncompetitive, and forces them to lose their elemental dignity? It is unsettling that the anger of the proletariat, who yesterday still belonged to the lower middle class is expressed as a crude racism. It is obvious that a Pole working for a third of a minimum wage, under shameful conditions, in a job that five years ago was done by an Englishman or a German for a normal wage, is not the one to blame. Sadly, the ire of the population, stoked by the media and politicians, keeps getting diverted towards this unfortunate foreigner. In fact, both the disenfranchised Brit and the immigrant are the victims of the system that forms the foundations of modern Europe. This is the EU: an affiliation of 28 states that keeps lowering the taxes for the rich and the corporations, an affiliation where the European bureaucrats do not pay an income tax, an affiliation of Countries where economic growth is based more and more on the destruction of workers’ and social rights. And this union points to the free movement of labour as their crowning achievement. To reiterate: the free movement of labour in the Western, richer European Countries benefits the rich, the higher class, and the upper middle class. For everybody else, it is an existential nightmare. And to these individuals, the workers who are willing to work for less money than is needed for a dignified life, pose a problem. They are like quislings in a war. They are the strike-breakers. Can we really approve of someone who is willing to work for less (regardless of their personal hardship), and as a consequence take a job of someone else? How was this ever acceptable? The European labour market plays one worker against another. Exploiting the plight of a Romanian woman, who can not survive in Romania, and is pitted against a distressed Italian woman who could not accept such low wages as that would mean relinquishing their none-too-stellar-as-it-is standard of life. This is the European Union. Why would anyone want to support such a Union? We should not forget that in the previous decades the profits of corporations and enterprises were constantly on the rise, and that the highest classes have never in history been experiencing so rapid an increase of wealth. We should remember that these growing profits are largely due to the circumvention of labour rights and actual reduction of working class wages. The growing fascism and hatred against immigrants and refugees, which often culminates in hatred against Muslims can be clearly blamed on the European Union and, of course, on all the Countries and governments that still follow the neo-liberal concept. Britain is among the least innocent parties in this respect. This is the only fundamental problem: There are more and more Europeans facing an existential crisis exacerbated by the fear of being unemployed. This fear is caused by the European labour market, where all the rules have fallen, and the golden standard is to exploit the employees. A market where it is permissible to play the poor and needy Easterners and “Southies” (for example, Slovenians) against the existing workforce. Do we really think that opulent xenophobia and the rise of nationalism in Austria has no connection to cheap workers without proper contracts from the Czech Republic, Slovakia, Hungary, Croatia and Slovenia, who are willing to work more for less money? Of course, businessmen (owners of Capital) are satisfied with higher profits. But why should this seem acceptable to an Austrian who has to accept a lower living standard to facilitate these profits, and is constantly reminded that the Slovenes of Styria, Carinthia and Prekmurje are far cheaper than them? British withdrawal from the European Union can turn out to be one of the best things that happened to modern Europe. If the intellectuals, and the left-wing and Union leaders are able to seize this opportunity. Brexit should signify the beginning of a new workers’ International, bringing together workers, both domestic and migrant, for we should understand, everyone is disenfranchised, and no one is in a good spot right now. The European Union, with its corporations and lackadaisical opulence can only be saved by admitting that it has betrayed the Europeans by serving the Capital. It should immediately start to recognize the rights and dignity of all workers by enforcing the same standards for all. Because otherwise the rage will only grow. The rage of employees whose lives are getting worse while profits increase and GDP grows, is growing stronger every year. If nothing happens sooner, it will only be possible to stop the fury with tanks, and an army. That is also a possible European future. Where the immigrants, who are no less victimised by the discriminatory legislature, will quite possibly be the first victims of this anger. This victimisation, where the rulling class under auspices of European treaties and national laws enacts the exploitation of labour and workers is especially true for Britain. The European Commission President Jean-Claude Juncker should therefore cease browbeating British sceptics; and the MEPs, another wealthy European caste, should stop applauding him. How shameful it was for them to reveal this week that they understood nothing, and that they do not understand the problems that the offended Europeans are facing. Great Britain has sent a very clear message to London and Brussels, on behalf of the European working class. The Brits may seem silly, and perhaps we can point to famed British arrogance. But let’s rather not. This behavior is an expression of a long-term hardship, for which the EU is not solely to blame, but it did help the neo-liberal politicians in all Countries to exploit their labour markets in order for companies to benefit to the detriment of their citizens. This is the hardship we need to address.